Over the weekend, the girls kicked off their fundraising for the year at the LCBO Whites Rd. and Hwy. 2 location in Pickering, during which they showcased hand-made posters and received wonderful support from the local community. Thank you to everyone that donated and to the management at the LCBO. This was a great start girls! Way to go! 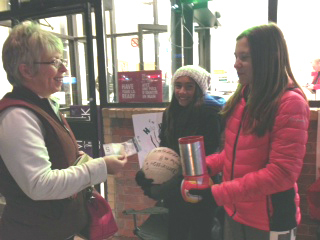 Jaimie & Sandra from the Durham Attack 13U Heat volleyball team receiving a kind donation during the teams’ fundraising effort at the LCBO Whites Rd. and Hwy. 2 location in Pickering. Purchase Your Holiday Gift Cards Now!